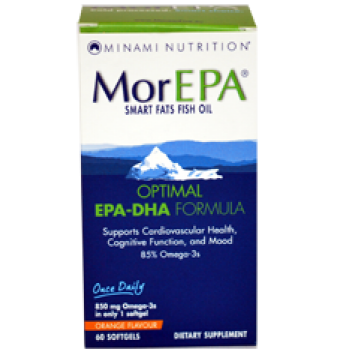 Minami Nutrition MorEPA Smart Fats is a one-a-day scientifically-proven fish oil supplement formulated to maintain a healthy heart, promote emotional and physical wellbeing, support concentration, joints and skin. MorEPA Smart Fats contains 85% of Omega3 formulation. Omega3 fatty acids are incredibly important for supporting heart health and emotional wellbeing, while enhancing concentration and maintaining joint and skin health. Due to the high concentration of omega3, only one or two capsules are required daily providing a minimum of 750mg/1500mg of omega3. Scientific studies and research has indicated that omega-3 fatty acids may contribute to the prevention of conditions such as heart disease, cardiovascular disease, diabetes, high cholesterol levels and a raft of other diseases typical in the western world. The supplement takes the form of orange flavour soft gels ensuring no fishy aftertaste!